The Daily Beast: "The Last Chance for Hugo Chavez in Venezuela:" Provides a litany of baseless anecdotes to depict President Chavez as a declining, unpopular, crass alternative to the refined proxy-candidate, Radonski. Newsweek ensures that readers are aware that Radonski is of Jewish descent and that relatives of his perished in Nazi concentration camps to add for him a layer of political immunity before Western audiences. Newsweek also implies that a victory for President Chavez would depend on "the old magician" to prevail with a trick. Daily Globe and Mail: "Decision time for Chavez the democrat:" Implies that President Chavez' loss is inevitable and that he must prove his dedication to "democracy" by gracefully bowing out. Other headlines include, "Have Venezuelans tired of the Chavez revolution?," "Fears abound ahead of close Venezuelan elections," "Election system in Venezuela: High tech, but low trust," and many more, all echoing talking points laid out long ago by the CFR, the Heritage Foundation, and other corporate-financier funded policy think tanks with a direct stake in installing Radonski as head of their planned client-state. This is based solely on recent numbers supplied by the suspect polling organization, "Consultores 21" almost exclusively cited by the Western media, and without qualification, repeatedly referred to as "respected." After holding a solid lead over Radonski throughout the entire campaign, Chavez has suddenly "slipped" in Consultores 21's poll numbers just in time for a coordinated propaganda push by the West claiming he is preparing to now "steal the elections." Image: NED is anything but a "promoter of democracy and freedom." Representing some of the largest corporate-financier interests spanning Wall Street and London, it merely couches global, neo-imperial hegemonic ambitions within the guise of "freedom" and "human rights." For Venezuela's opposition, it is indefensible to take money and support from NED, and indicative of their service to foreign interests, not the people of Venezuela. Democracy Digest, the clearing house for the US State Department's National Endowment for Democracy (NED) has relied exclusively on poll numbers from Consultores 21. In a NED post literally titled, "How Chávez ‘plans to steal Venezuela’s election’" part of a corporate-financier funded Heritage Foundation report is reproduced, citing Consultores 21's numbers as the sole basis of "fears" that Chavez will "steal the elections." The report enumerates "steps" the US should take, in regards to the elections in a foreign sovereign country, to "defend democracy in Venezuela while advancing U.S. interests and values:"
Support Venezuelan civil society. Despite restrictive Venezuelan laws, the U.S. should increase its democracy assistance to civil society and NGOs by working to train domestic electoral observers, urge voter participation, coordinate collection and tabulation of voting results, and encouraging all polling stations to report electoral infractions to the CNE and the MUD. Conduct systematic public diplomacy. The Administration should prepare a public diplomacy brief examining the erosion of democracy and the unfair advantages accumulated by Chávez. It should report the fact that electoral conditions are far from fair. Reaffirm principles of democracy. President Obama and Secretary Clinton should speak out on democratic principles and the commitment to full democracy, not merely holding elections, in the Americas, highlighting what is at stake in Venezuela, urging citizen participation and transparency, and holding Chávez accountable for the preservation of peace. Dispatch U.S. observers. The U.S. embassy in Caracas should send its staff in a systematic fashion to monitor the elections on October 7, and Washington should assign additional State Department officers to temporary duty in Caracas. Call for bipartisan monitoring. The Administration should call on the State Department to assemble a high-level working group of analysts, congressional staff, academics, and electoral experts to monitor and evaluate the election and its outcome. Heed early warning signs of violence and instability. The Administration should closely monitor the situation in Venezuela on October 7 for evidence of incitement to violence by political parties, harassment of or harm to opposition figures, reprisals against voters, distribution of arms to militias, and increases in politically-related violence. Establish a coalition for Venezuelan democracy. The U.S. should employ active diplomacy to establish a coalition of democratic leaders—one that could certainly include Canada, Costa Rica, Panama, Chile, Spain, the United Kingdom, and others—to act in unison in case of fraud or violence. Continue support for democracy. Although the defeat of Capriles would clearly demoralize many Venezuelans, the U.S. must nonetheless continue to offer sustained support for civil society, a free press, free labor unions, and other voices for liberty and preserve the resilience of a unified opposition for future elections. Appoint a high-level Cuba/Venezuela Mission Director. The position of Cuba/Venezuela Mission Director in the Office of the National Intelligence Director should be filled with a senior-level official with responsibility for all ALBA countries. Develop an aggressive, proactive plan of action. October 8 will mark the starting point for one of two courses: either one of sustained cooperation and support for the restoration of democracy in Venezuela or one of tough, proactive responses to Chávez’s promised radicalization. Potential policy tools for leverage include visa denials, further Treasury designations of corrupt Venezuelan officials, financial and trade sanctions, interdiction of Venezuelan vessels and aircraft used to transport drugs, the designation of Venezuela as a state sponsor of terrorism, and an embargo on the purchase of Venezuelan oil. All of these tools should be considered in the event of electoral fraud, significant electoral violence, or hostile acts contrary to U.S. security interests. To promote democratic dialogue between workers and business managers and build a framework that fosters a democratic, market-oriented culture within Venezuelan companies. CIPE will foster greater dialogue on worker/employer relations by organizing roundtable discussions with business owners and managers, workers and union leaders. To strengthen public-private democratic dialogue and free market principles in Venezuela. CIPE will support its local partner to carry out policy based analysis by publishing information bulletins, organizing events to distribute and discuss its research, and participating in a radio program to discuss key economic issues. To promote greater standards of transparency and accountability in Venezuela’s national government. This program will monitor the work of key government institutions and publish regular reports about their activities. To strengthen public debate about the need for greater standards of municipal governance. This program will carry out a multifaceted communications campaign to raise public awareness about innovative strategies for strengthening local governance in Venezuela. To strengthen the capacity of civil society organizations to observe the state of various aspects of democracy, including freedom of expression and association, citizen participation, municipal elections, and oversight of government agencies. This program will train civil society organizations to observe and analyze indicators of democracy and will compile and disseminate a document to publicize the results. To promote effective risk management policies throughout Venezuela. This program will facilitate dialogue between government representatives, the private sector and civil society in order to establish a truly inclusive platform for discussion about natural disaster planning. To promote youth commitment to civic participation, democratic values, and community service. This program will organize activities for youth members on issues of community participation, social action and leadership. To strengthen the democratic values and leadership of youth in Venezuela. This program will establish a strategic coalition of organizations to provide intensive on issues including democratic principles, human rights, non-violent conflict resolution techniques, public speaking and communications skills. To strengthen the role and participation of women in community based efforts to confront rising levels of violence. This program will provide women with leadership training and help them to establish effective community networks that can be used to address the root causes of insecurity in their neighborhoods. The program will also facilitate communication between these women and elected officials in an effort to promote responsive public policies to challenge the growing challenges posed by violence in the country. To promote the creation of a new generation of political leaders with a deeper understanding of democratic values. Through an intensive training course, this program will prepare and encourage young community activists to become involved in public service and assume leadership roles in the country's political processes. To promote greater citizen participation in the dissemination of information in Venezuela. This program will organize a series of forums and virtual events as part of its effort to build a network of citizen journalists. This program will also provide project participants with training on communications technologies as a tool for promoting democratic participation. To provide young, emerging leaders from across Venezuela with training on democratic values and leadership skills. This program will design a series of academic exercises and site visits to help young leaders gain a better understanding of how to defend democracy in Venezuela. To promote a new generation of youth leadership committed to democratic values, non-violence and human rights. This program will carry out a national leadership training seminar for university students throughout Venezuela. To strengthen the participation of youth and students in the Venezuelan political process based on a deep understanding of the Universal Declaration of Human Rights. To improve the democratic leadership and citizen participation skills of Venezuelan women, especially of the lower and middle classes. This program will conduct a series of workshops and forums to improve women's leadership skills and ability to effect democratic change in their communities. To promote democratic values among the leadership of workers and owners of small-businesses in Venezuela. This program will identify and train leaders to promote a culture based on values such as self-reliance, productivity, solidarity, democracy and citizen participation. To establish an institute that will provide strategic analysis and recommendations to a wide range of democratic actors – such as media, unions, business, youth, and civil society organizations – regarding the most effective ways to address the democratic opportunities and challenges facing the country. To carry out a program to strengthen democratic governance through citizen participation in the formulation of public policies in Venezuela. This program will organize a set of regional workshops to analyze and propose public policy solutions to issues of citizen concern and will advocate for their adoption by government officials. To strengthen the role of media to promote democracy in Venezuela. This program will evaluate the current efforts of media outlets to defend and strengthen democratic institutions. It will use the results of its analysis to foster greater discussion between journalists, civil society leaders, unionists and academics about the role of the media in Venezuela. To promote dialogue among Venezuelan youth on the importance of freedom of expression. To defend freedom of expression and freedom of the press in Venezuela. This program will monitor and report on threats to journalists and violations of freedom of expression, and distribute this information to domestic and international audiences. To assess and promote greater levels of representation of young Afro-descendants in public institutions in Venezuela. This program will conduct an assessment of the racial diversity of public institutions and the opportunities they provide for Afro-Venezuelan youth to participate in public decision-making roles. To promote a deeper understanding of human rights for the families of victims of police abuse and to foster greater respect for human rights among police officers. This program will provide families of victims with training on legal protections and options for seeking accountability and justice. Additionally, this program will train police officers on the need to respect human rights. To develop new strategies to respond to crime and violence. This program will train municipal police officials on new techniques for addressing challenges to citizen security and help them engage community leaders to develop joint proposals for responding to these challenges. To promote free, fair and transparent electoral processes and promote voter participation in elections. To promote greater participation in electoral processes by identifying and addressing key obstacles to voter turnout. To promote greater youth participation in Venezuela's elections and strengthen citizen oversight of the electoral process. And because of Venezuelan laws that prohibit foreign meddling in their internal political affairs, many of the specific organizations the US State Department is funding are not listed, instead very general activities are listed with innocuous-sounding titles like "Democratic Ideas and Values." Within Venezuela, organizations likewise fail to disclose the source of their funding, a seemingly paradoxical violation of the "rule of law," "transparency," and "democratic ideas and values" NED is so vigorously subsidizing. However, it is clear that polling organizations like Consultores 21 fulfill precisely the objectives NED is hoping to accomplish - that is the ability to manipulate election polling and results, as well as build up a client-opposition movement with which to undermine Venezuela's sovereignty. An identical operation was recently carried out by the US State Department against Russia. Despite Russian President Vladamir Putin's strong polling numbers, and long predicted sweeping victory (even by his opponents), "independent" "respected" polling monitor GOLOS claimed the elections were rigged - claims quickly seized upon by overtly US-backed street mobs who attempted to spark a popular uprising - riding the wave of similarly US-engineered unrest that characterized the "Arab Spring." 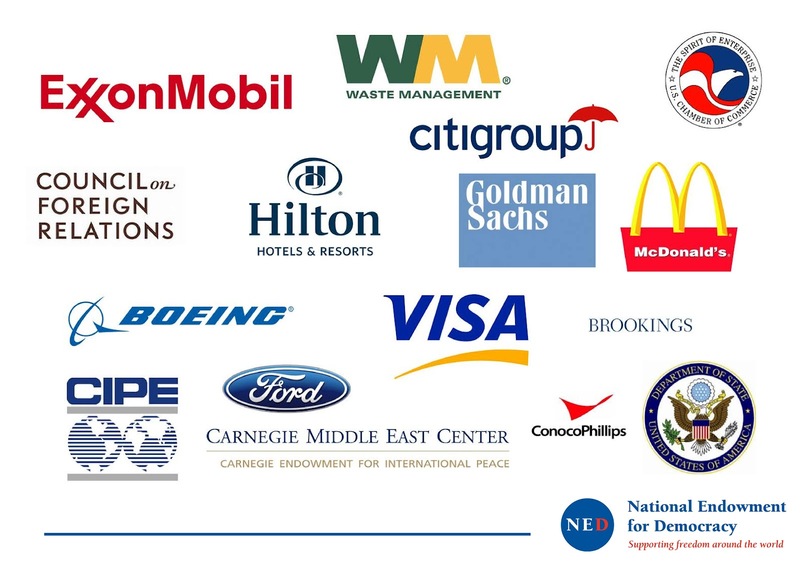 Image: NED's official website lists an astounding number of proxy-organizations it is funding to conduct subversive activities across the Russian Federation. GOLOS is just one of many NGOs funded by the United States government, overseen by the US Embassy in Moscow, Russia, and used to meddle in the sovereign internal affairs of their nation. Likewise in Venezuela, a troupe of foreign-funded subversive organizations is coordinating efforts with the Western press to overthrow the political order of Hugo Chavez and install a client-regime of their own design. It was promptly revealed that GOLOS was listed by name on the US State Department's NED website as a recipient of US government funding, clearly in contradiction of the Western press' assertion that the polling organization was "independent." As in Venezuela, the Western press attempted to portray the Russian elections as "rigged" and "stolen" long before they were even held. In Russia's case, even President Putin's opponents had no doubt that he would soundly win the elections, yet they and their Western backers decided to call the elections "stolen" regardless. The purpose of this was to justify long-planned and organized street mobs, protests, and other subversive activities meant to further build up a client-opposition movement inside Russia, using "stolen elections," however ridiculous, as a unifying battle cry. These same claims of "rigged elections" and the "illegitimacy" of the current government have even been used by the West in defending a increasingly violent resurgence of terrorism in Russia's Caucasus region. In a similar manner, the widely popular Hugo Chavez has defeated his opponents at the ballot box and against their covert, violent attempts to overthrow his government on numerous occasions. It is unlikely that a US-trained lawyer representing foreign interests is about to unseat Chavez in an election, but like in Russia, the doubt needs to be planted in the minds of the global public to justify the US-engineered unrest that has been long-planned. As in Russia with the West attempting to justify terrorism as a result of an "illegitimate" government coming to power, a similar scenario, using heavily armed mercenaries to seize upon post-election, US State Department-subsidize hysteria, is not beyond the realm of possibilities for Venezuela. Should President Chavez claim another victory over US-proxy Radonski, expect mobs to take to the streets and be characterized as "peaceful" "pro-democracy" protesters by the Western press. However large or small these mobs may be, they will be depicted as vast throngs of people. Be particularly vigilant against the West's shadowy legions of "mystery gunmen" deployed amidst US-engineered unrest from Tunisia and Egypt, to Syria and Iran, and even as far as Bangkok, Thailand. The purpose of deploying these mystery gunmen is to create the illusion that the government is brutally cracking down on "legitimate, peaceful protesters," and will be used to justify increasingly violent insurrection, just as the West has done in Syria. Image: Bangkok, Thailand, April 10, 2010. 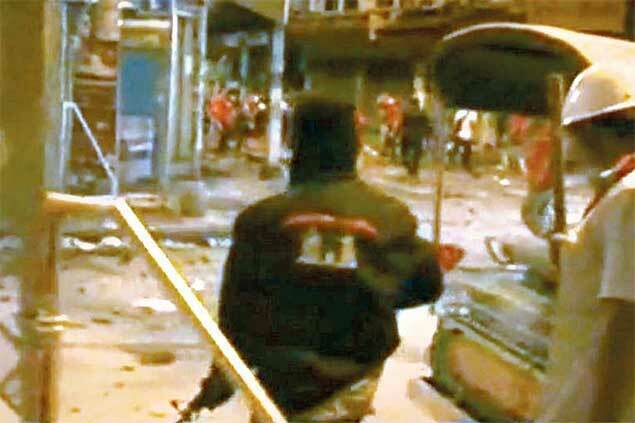 Wall Street-proxy Thaksin Shinwatra's mobs took to the streets, providing cover for armed militants dressed in black, purposefully using M-16 rifles to target protesters and security forces alike. The result was a deadly crossfire used to this day by the West to portray the government as guilty of brutalizing "peaceful" "pro-democracy" protesters. This tactic has been repeatedly used around the world as the centerpiece of covert destabilization, in Tunisia, Egypt, Syria, and even once already in Venezuela in 2002. Should President Chavez lose the elections, it is likely it will be perceived by his supporters that the election was stolen by the many subsidized election monitoring groups, observers, and counters listed on the US State Department's lengthy NED Venezuela page. Unlike US-backed mobs, pro-Chavez protesters attempting to decry such a result will not be portrayed as "pro-democracy," but rather as "Chavez loyalists" and any violence, whether committed by these protesters or not, will be squarely blamed on them. "Rooftop" snipers are again to be watched out for, as it is with these covert operatives that the forces of foreign destabilization use to target security forces and protesters alike to compound and manipulate the subsequent fallout. For an instructive, signed confession of the various options the US indeed uses around the world to subvert and overthrow soveriegn governments, readers are encouraged to read the Brookings Institution's "Which Path to Persia?" report. Full analysis of each option has been given (and here), and it is very easy to see how these options can be easily arrayed against Venezuela as well. Everything from funding terrorist organizations, to buying off the military, to organizing staged street protests with covert military operations conducted in tandem are fully admitted to - and now have been demonstrably carried out against Iran. 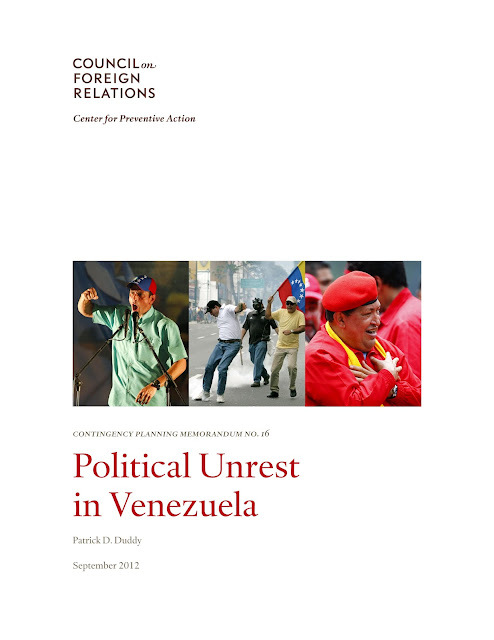 By reading the report and understanding that many of these options have already been considered and put into motion against Venezuela as well, according to the CFR, Heritage Foundation, and NED, it would serve as an instructive document to inoculate our perception with before the Western media expands its coordinated propaganda campaign against Venezuela, both pre and post-election.